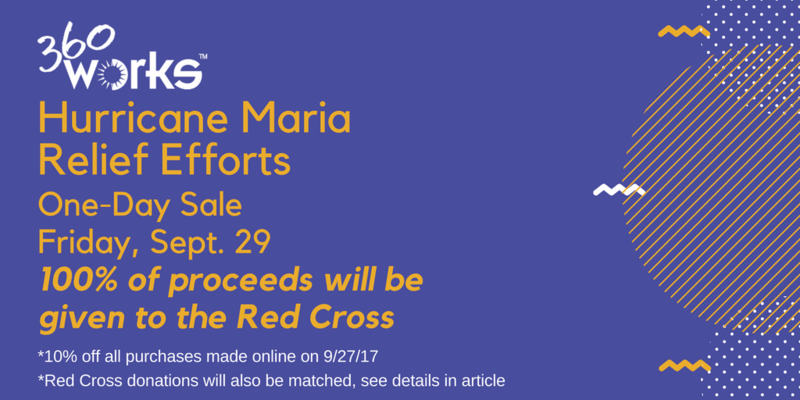 360Works is having a one-day sale on Friday, September 29, 2017 to help relief efforts for the aftermath of Hurricane Maria in Puerto Rico and the Virgin Islands. This Friday, all 360Works plug-ins and add-ons will be available for 10% off using the discount code 360HELPNOW and all proceeds will be donated to the American Red Cross for Hurricane Maria relief efforts. Hurricane Maria left the entire island of Puerto Rico in devastation. It is now one week since the hurricane hit the islands, and millions are still without power, fuel, and clean water. Communication is non-existent in many areas as cell service has been interrupted with cell towers down. Food is becoming scarce. Today, CNN reported that in the town of Utuado, Lydia Rivera has started to ration crackers and drink rainwater to keep her two grandchildren alive. "No water, no food," Rivera told CNN. People with medical conditions are at risk of death, as diesel supplies diminish and limit the power supply for generators powering hospitals and home breathing equipment. The American Red Cross has had their employees and volunteers on the ground in Puerto Rico and the Virgin Islands since before Hurricane Irma made landfall a few weeks prior. They are continuing to expand their relief efforts by shipping satellite phones and other technology supplies to help with the interrupted cell service and bringing relief supplies such as water, ready-to-eat food, cleanup kits, home repair kits, insect repellent, and more. At 360Works, we believe we can work with our customers to make a difference. Make any purchase at 360works.com on Friday, September 29, 2017 from 12:00 a.m. to 11:59 p.m. ET using the 360HELPNOW promo code, and 100% of all sales will be donated to the American Red Cross. If you would prefer to make a contribution directly to the Red Cross rather than buy a product from our online store, we will match the total amount of these donations, beginning Wednesday, September 27 through Friday, September 29. For all direct contributions received up until Friday, September 29th, 11:59 p.m. Eastern Time, 360Works will match the total amount of donations up to $5,000. Please use this link to make direct contributions to the 360Works Hurricane Maria Relief Efforts. Thank you for your support over the years, and for working with us to help those in need.